Home > English For Children > How Does Dyslexia Affect A Child's Language Skills? Dyslexia is a learning disability that causes difficulties when learning to write, read and spell. Although Dyslexia doesn’t affect speech as such, it may limit a child’s understanding and ability to learn new words. As children with dyslexia may have problems with their short term memory, it makes it difficult for them to process and remember information. Dyslexia is not caused by lack of motivation, emotional problems, and lack of education or sensory impairment. Dyslexia is neurobiological or of a genetic origin that creates a weakness in the ability to process language based information. It usually runs in the family and it can affect anyone at any level of intellect. It is believed that dyslexia affects at least 10 per cent of the UK. How Will Dyslexia Affect My Child? When your child has Dyslexia, you may notice that they can read perfectly well. However, they may struggle with writing, spelling, recognising certain letters, memory and their organisation skills. Dyslexia can cause problems in maths as well as literacy. Some people with dyslexia have problems recalling certain number facts, and may have difficulty with basic arithmetic. You may notice before your child even goes to school that they have problems processing and remembering certain pieces of information. Sometimes, dyslexia isn’t diagnosed until secondary school or until adulthood. As with anything, the sooner it can be spotted the better. This is so teaching methods can be adjusted to suit the child with Dyslexia, and allow them to live a perfectly normal life. Children naturally have short attention spans; however, a child’s attention span should get better as time goes on. If your child has a short attention span it could be sign of Dyslexia. Putting objects and toys into a sequence is a good way to see if your child is progressing well or not. If your child is unable to put things into sequence whether they are numbers, letters, colours or size, it could be a sign of Dyslexia. Children progress at different rates when they go to school. However, if your child is far behind the other children in the same age range, they may have Dyslexia. Another sign of Dyslexia is children writing letters and numbers the wrong way round. It is not uncommon for lots of children to do this anyway, but if your child continues to do it well into the school years, it may be a sign of Dyslexia. 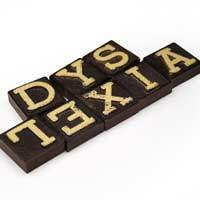 Constant problems with spelling and reading may also be because of Dyslexia. Having Dyslexia doesn’t mean that your child cannot achieve wonderful things. Now that Dyslexia is recognisable, steps can be taken to provide your child with the right kind of teaching and training. You and your child’s teacher need to be patient and outline teaching strategies especially created for children with Dyslexia. It is likely that your child will need extra tuition outside of school as a result of Dyslexia, but this will take away the pressure that they may feel when at school. Your child’s school will be able to give you a list of books suitable for your child, they should also give you lots of up to date information in how to deal with children that have Dyslexia. The most important thing to remember is if your child does have Dyslexia, not to lose hope. There are lots of fantastic organisations that will offer advice to you and your child. Even if your child does have Dyslexia, it doesn’t mean they will not go on to lead a full, well-rounded and happy life.